What color says Christianity to you? You are making the program for a Christian outreach event. It will be a musical event of some sort with big name Christian groups in some sort of stadium. Unlike some other music performance, the "main attraction" of the concert is never actually seen on the stage. How do you set up a program that draws attention to the reason for the concert and still gives information about the concert? Remember, it needs to be tasteful. You need a color scheme. While most of the program is probably white (that's fairly standard), what are your accent colors? For a Chrstian outreach event, what colors would say "grace" and "salvation" to the people who see the program? What sort of images would get used in a program like this? A cross is obvious, that's the most recognizable symbol of Christianity. What else is there? What is the cover image? Is it a Christian symbol, a picture of a band or something else? What do you want people to really remember when they see your program? Will your title font be bold and daring, or quiet and demure? Should it be something that overpowers you, or something that subtly sneaks up on you? What font helps show both the majesty and the love of God? What will fill up your pages? A list of songs to be played? Will you include logos of the sponsors? Would "testimonies" of the bands be appropriate? The program you create forms an impression with the concert goer. What are you trying to emphasize? 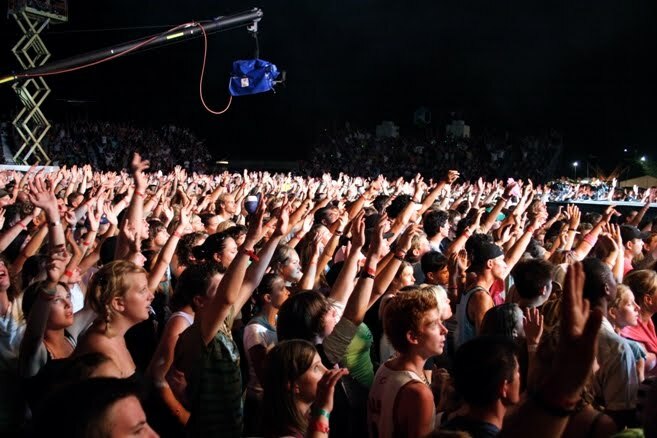 What is the main thing you want the concert goer to remember? This should become crystal clear when people see your program and it is something you need to think about BEFORE you start.